Small Ceramic Plant Pots (2.4 inches high) – Perfect for holding a single small succulent, herbs or a cactus plant. 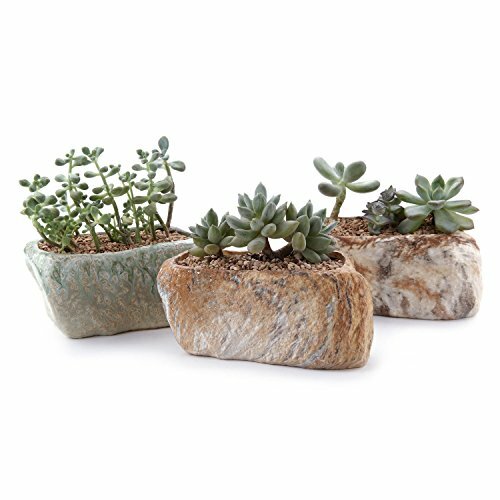 Small Ceramic Plant Pots – Perfect for holding a succulent, herbs and cactus plants. Indoor Use – Ideal for windowsill and office table decoration; Perfect Gift for Weddings, etc. Pack of 3; Dimension: 13.5 x 6.5 x 6.2cm / 5.3 x 2.5 x 2.4inch (L x W x H). Location: Although small in size, these attractive pots would look nice in a man’s office, man-cave or a den. The small size makes them a perfect addition to a desk or a small table.